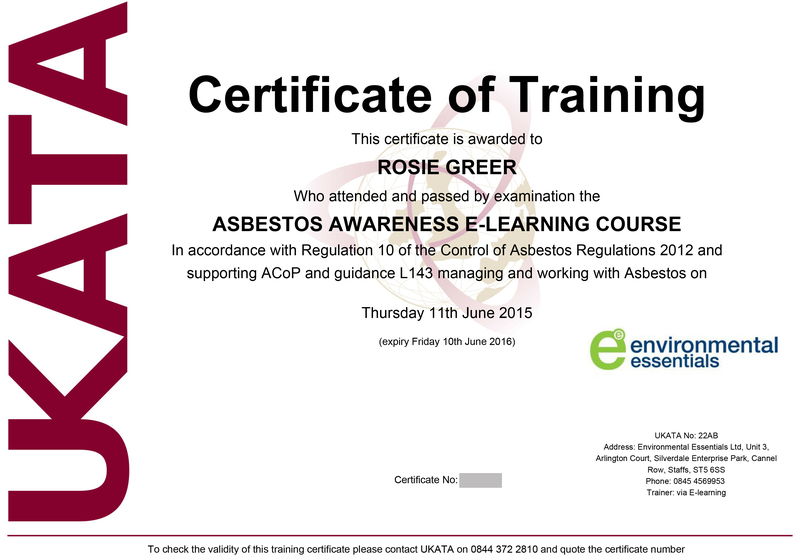 Online Asbestos Awareness Refresher Training certified by UKATA - Best Price Guarantee. See demo videos below for a snapshot of the course. In accordance with the HSE guidance - refresher training should not be a repeat of the initial training. Refresher Asbestos Awareness training should be given as necessary to help ensure knowledge of Asbestos Awareness is maintained, (UKATA provide 12 months certfication following a course) and it should be appropriate to the workers' familiarity with the work. Environmental Essentials course meets these requirements by having a fully functional Training Needs Analysis / TNA to ensure each learner gets the necessary training they require. All learners start the course with a training needs analysis (TNA) which tests their current knowledge and identifies any gaps and takes the form of a multiple choice question answer session for each of the 5 modules covered in the full course. If a learner correctly answers 3 questions for a module they will be given access to a condensed module which will provide an update on the key points. If they do not correctly answer 3 questions they will be required to undertake the full module to ensure they are Asbestos Awareness trained before undertaking the multiple choice exam. The course will automatically select the right course. Asbestos Training is a legal requirement for all workers who are liable to disturb asbestos during their normal work should be trained so that they can recognise asbestos containing materials and know what to do if they come across them. New team members quickly brought upto speed, Induction. * This course is availble for anyone who has undertaken a UKATA Asbestos Awareness course within the 15 months. We recommend the course is undertaken in a quiet learning environment, free from distraction and interruption. Whilst every effort is made to ensure our E-Learning is suitable across all devices, we suggest you ensure your web browser is current. UKATA E-Learning standards strongly recommend a screen size of 10" although a screen size of 7” is an absolute minimum requirement. The best device would be a computer or Laptop, but the course can be completed on a tablet device. The device you use must have sound enabled as the course includes voiceovers to enhance the learning experience.